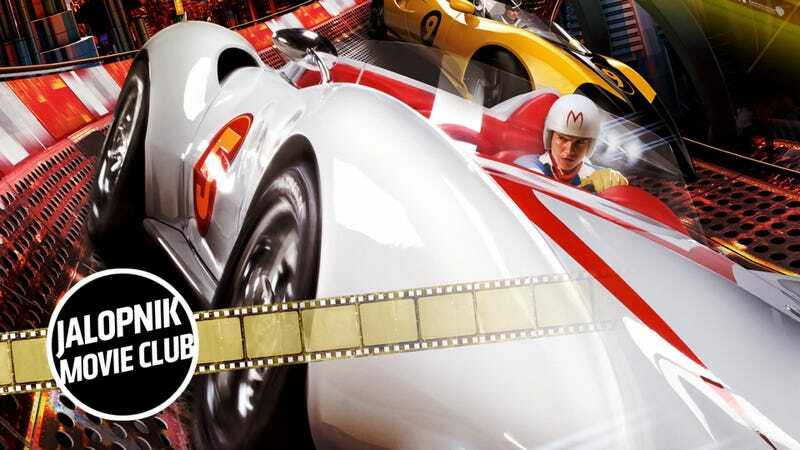 The Speed Racer movie—inexplicably brought to you by the sibling duo who created The Matrix, of all things—caught a lot of flack when it was released back in 2008. But it’s a visually stunning, overly earnest and straight-up weird movie that’s definitely worth a second chance. Speed Racer is, of course, one of the first Japanese anime cartoons to make it stateside back in the 1960s. The show originally called Mach Go Go Go reached millions of kids around the world in the decades it was in syndication, and probably got a few of them into cars and racing along the way. It’s a beloved show, so obviously expectations were high for this live-action version. And it embraces its cartoon heritage with gusto. Right away, the incredibly realized color and playfulness of the Speed Racer universe is extremely overwhelming. The opening sequence successfully accomplishes setting up Speed Racer (yes, that’s his name, because in this universe my name would be Car Blogger, or possibly Terrible Neurosurgeon) as our main character, his friends and family, his motivation and leads right into the main conflict of the movie. But while it’s impressive to look at, it never knows when to let off the gas. The stylish flair the The Wachowskis, the same duo responsible for the Matrix franchise, hits you too fast and too soon, all the time. Once we move past that opening, the rest of the film’s first act is weirdly slow. The world building is jarring and uneven, thrown at the audience with little nuance. The goofy, earnest quality of the characters seem to be right on the edge of the line of bad acting, and it really makes you wonder why in the hell this thing is over two hours long. That’s a lot to ask! It takes a lot from its cartoon origins, but never seems to know how far to go with it all. But once you get all of that out of the way, once you’ve accepted this universe and these characters, and the harder-hitting points of story start to drop, the issues fall away and the movie becomes an enjoyable experience. The damn thing’s just fun. Like a cartoon, it works best if you don’t think about it too too much. The second half of the movie becomes a series of stunning sequences, and the overly earnest groaning character choices from earlier in the movie develop into something with some emotional impact and real heart. The jokey, corny attitude falls away at the right moments, like with Speed Racer’s conversations with his parents, when he confronts Racer X about his brother, and the final racing sequence. If you take a look at contemporary reviews of Speed Racer, both critics and audiences weren’t exactly onboard with its oversaturated style and simple, overly earnest family-oriented storyline. It is a very different animal from the Matrix trilogy, or any of the the Wachowskis’ later work. Taking that into consideration, it really makes you wonder how this movie would do if it had been released today, where similar pulpy action movies from the Marvel Cinematic Universe make billions relying on a lot of colorful computer graphics and family-friendly character arcs. Remember, 2008 was the year Iron Man came out, so it could even be argued it was just too far ahead of its time. What’s different between Speed Racer—a movie where a young guy discovers his full potential while taking on an existential threat with the help of a team of friends and family supporting him amid a spectacle of CGI action sequences in a hyper-saturated altered reality setting—and Guardians of the Galaxy and Thor: Ragnorak? “You don’t climb into a T-180 to be a driver, you do it because you’re driven,” was pretty damn good, too. Relax a little bit, accept the goofy tone Speed Racer projects on the surface, and then let yourself enjoy the heart and flair. It deserves a second chance. I think I’m the only person who likes this movie. I often feel like I’m the only one who remembers it exists. In this movie we see the following: A child flips the bird, a monkey flings some feces, and a boy drinks some milk. I now remember why I relegated speed racer so far back in my mind. I feel as though this would have been the visual product if Hunter S Thomas had been assigned to Le Mans ’71 and actually watched the race consuming nothing but acid. Speaking of which, I wish I had been on acid re-watching Speed Racer (2008)… It felt like a half a step up from a TV movie. I would have been angry if I had gone to see this in the theater as a late teen. I suppose the target audience doesn’t contain as many numbers as my age, but modern kid films usually manage clever double entendres or hidden innuendos for a semblance of adult entertainment. I like many bad films based around cars but this one really doesn’t do it for me. I feel no connect to Speed, his family, or the monkey. I’m not routing for or against them, I just simply adopted a laissez faire view. It’s the same with the Mach 5 or Mach 6. When the cars are all pin balling off each other and jumping and certain hits do nothing and others are catastrophic. There’s only one actual bonding moment with the Mach 6 and it’s basically the end of the movie. The acting is just horrendous on everyone’s account with the exception of the monkey. The race visuals were very good back in 2008 but they’re getting dated. The use of green screen is very noticeable. The jokes are childish, as is the story. The racing is predictable and thus boring. The frame transitions are awful. This is the worst live action adaption of an Automotive Manga I’ve seen. The foreign indy quality films of Initial D and Wangan Midnight are surprisingly better even through subtitles. I will fully suggest that this would have gone over better as an F-Zero movie with Cpt Falcon taking on a big corp, with a more underdog tone and outcomes as well as with more presence and strength and axing the child goofiness. The whole hero rises up shtick as a source of inspiration. It plays into the era of the viewer better. At any rate Speed Racer (2008) was just such a miss for me as I have never viewed the Anima or Manga so it really makes me question its draw as a series. Movie: After this review I probably won’t ever watch this again, I wouldn’t bother showing it to my kid. I’m giving it a F.
Car Movie: I don’t believe the film drew enough inspiration towards the Mach 5,6 or any of the other cars in the film. They were just kind of different colored vectors that could have been fighter jets or rocket powered bathtubs. That’ll be a C.
A mediocre live-action remake OR a great way to broach harsh realities with your child. As someone trying this thing called adulting, I can’t justify myself spending another two hours watching Speed Racer again. I do, however, see myself subjecting my kids, when the time comes, to this pink and purple explosion. And that’s where, in my opinion, its value lies, as a tool to introduce our young ones to the harsh realities of the world, a CG augmented utopia where Gladiator-like racing is the norm...reality. First, this movie does teach kids the value of being yourself and focusing on your strengths. Perhaps my kid might be struggling in one subject. Maybe I’ll tell him that, like Speed, focusing on what you’re good at is just as important. There’s also a loss of a family member. Some heavy stuff here. But fear not because the plot takes the edge off that Rex Racer is just Racer X. Speaking of Rex, you might touch on how, in life, your decisions have consequences you have to live with. But you should make clear, like Rex Racer, you can’t just change your face. There are other less edgy subjects to chew on with your little one during that post-movie ice cream. There’s corruption on a global scale, for one. You can discuss how, in life, there are bigger pieces in play that affect normal people (e.g. Royalton Industries and Ben Burns) For the short run, although these unscrupulous corporations might succeed, in the end, the truth comes out. I could go on and on with this movie, but you get the picture. I know the visuals of this movie are polarizing, but I always enjoyed them and I thought they fit the overall character of the movie well. In some ways, the art style serves as a juxtaposition to the Racerfamily: they are a family just like any other trying to make their way in this kooky, over-styled world. Plus, the sound design is absolutely amazing, especially if you have a good sound system. Full disclosure: I’ve seen this movie at least half a dozen times and I love it unfailingly. Growing up my dad introduced me to the original cartoons, which I would watch whenever possible. This movie came out back when I was in middle school, and I loved it instantly, but it still holds up to the scrutiny of my older, more cynical self today. For one, the characters are perfect. Every person in that movie has a genuine reason for doing what they do. In fact, the whole movie is heart-wrenchingly genuine, and they nailed the family dynamic. The scene where a troubled Speed converses with his parents is one of the most honest moments I have ever seen on film. This movie makes you feel things. All these elements really build to make the final race one of my favorite climaxes of all time. Once things ‘click’ for Speed, the audience totally feels the combination of elation, wonder, and excitement that he and the Racer family experience on the screen. As Speed crosses the finish line on that final musical swell, his triumph is yours. The movie does have problems. Some of the effects are clearly CGI, and would’ve looked sketchy even in 2008, I feel. Also, I know Spirtle and Chim-chim are supposed to be comic relief, both in the original show and in the movie, but they were getting uncomfortably Jar-Jar. Finally, if you’re going to discuss the tech details of the racing build, can we get some more information somewhere earlier in the film, or at least a more fleshed-out explanation? I have to be honest, although I’m a big anime fan, I haven’t seen much of the original Speed Racer show (though I did see the Dexter’s Laboratory spoof episode). But, I am aware of how much of an influence the original show, known as Mach GoGoGo (which has a multitude of meanings on its own), had on not only the anime industry, but the perception of anime in the West, especially in the States. To me, the Speed Racer movie seems, much like the original Pacific Rim, a love letter to the anime on which it’s based. The funny thing is, while I love Pacific Rim, it wasn’t exactly critically acclaimed. But when I walked into Pacific Rim, I was hoping to see giant robots vs. giant aliens in a somewhat gritty setting, and I was blown away. So it was strange to me, when I was watching Speed Racer as a car enthusiast, to be critiquing some of the details the film drops. How the hell is Speed shifting? Why does that Bernoulli thing jump-start the car when you put it in fifth gear? What year is it? But as soon as reminded myself that I wasn’t supposed to be taking this seriously, kind of like how logically speaking the robots and monsters in Pacific Rim could never physically exist, I was able to appreciate the movie for what it is: a visual treat for the eyes and races straight out of the coked-up minds of the Wacky Races people. Seriously, there are some amazing scenes in this movie: when Speed and Trixie talk in the car while it rains outside, lit by neon purple; the camera flashes during the race scenes; the trails of smoke, light, and action. It perfectly captures the hyper-kinetic nature of anime and manga. The over-dramatic monologues of the villains and protagonists are also cut straight from the source material. Speaking of which, the plot of corporations using racing to exert influence? I’m not poking fingers at Ferrari, but the notion isn’t entirely far-fetched. Can we also get a standing ovation for the cars? They make no sense from an aerodynamics perspective, but for sheer Rule of Cool, few designs beat these wheels. They could’ve come straight from a late-night design session from the desks of the Vision GT designers after having watched one too many clips from Wacky Races while alternating between Five Hour Energy and bourbon. I was also pleasantly surprised by Trixie. I think she deserved more development, and more backstory, but I loved how she wanted to get right in and get dirty, both in the copter and in the car. She ain’t a damsel in distress, but someone who can stand with Speed as an equal in action. For the first movie directed by the Wachowskis after the very blue and green (and generally overall grey) Matrix movies, this is an unashamedly colorful movie, and is all the better for it. It fits just about perfectly with the idiom of the original series, and is just generally fun. Even if it’s basically like a less self-serious, car themed episode of Yu-Gi-Oh, complete with the final part being resolved with an automotive version of the Heart of the Cards. Speaking of next week, we’ll be reviewing the Days of Thunder, which is on Netflix this month, so be sure to get it watched and collect your thoughts, and write in with your opinions and hot takes to justin at jalopnik dot com. In the meantime, sound off below about the good and bad of Speed Racer and all of its hyper saturation and eye-crossing action sequences, and see you all next week!